When are Late Start days? Late Start/Teacher Collaboration days occur on Wednesdays throughout the year: 2018-19: Sept. 12, Sept. 26, Oct. 10, Oct. 24, Nov. 7, Nov. 28, Dec. 12, Jan. 9, Jan. 23, Feb. 6, Feb. 20, March 6, March 20, Apr. 10, Apr. 24, June 5. On these days, Zero Period starts at 8:35am and 1st Period starts at 9:24am. Please plan accordingly. If my child needs extra help, is tutoring available? Yes, there are many types of tutoring opportunities available. For specific details, link to this page. What are the current Internet safety issues that parents should be aware of? Here's a helpful, up-to-date (as of 1/25/19) article from CNN: "Apps you've never heard of that your teen is already using"
During Modernization is there additional parking--especially on days where the Don Wash Auditorium is being used and there are buses parked on Stanford Ave. or 7th St.? YES: We have an agreement with the First Baptist Church of Garden Grove (on Euclid and Stanford). Please refer to the map on this page for the traffic flow through the parking and and for the available additional parking spaces. 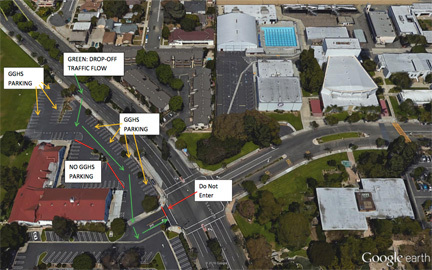 For more details on parking and an expanded picture/map, click here.